An aircraft bill of sale form is a document which is to be made by parties who are involved in a sale transaction of an aircraft. This form serves as a sale agreement between the owner and the buyer of an aircraft. The main objective of creating an aircraft bill of sale form is to lay out the terms, conditions, and the agreements of the aircraft owner regarding his intents of selling the aircraft as well as his legal ownership and rights to the property. What Should Be Done to Make an Aircraft Bill of Sale Form a Legal Form? An aircraft bill of sale form can be made official as soon as the seller and the buyer will affix their signatures and names on the form. But, to make the bill of sale be a legal form, a notary public must notarize the form. This means that during the day when the seller and the buyer of the aircraft will finalize and sign the bill of sale, a notary public and the attorneys of each party should be present. These legal professionals will review and recheck the bill of sale to determine whether there are items which are not stated yet required by the State in lieu of selling and changing the ownership of the aircraft or not. Once the bill of sale is verified and validated, the seller and the buyer will be signing the form with the presence of the attorneys. After they sign, their attorney will sign as witnesses of the agreement or the contract which will then be followed by the notarization of the notary public by placing a notary seal on the form with his name, title, and signature, as well as his official seal. State agency information – This is the first part of the form which should be located at the topmost portion of the document. The information which will be indicated in this section will be the country of where the sale is observed, the authorized or legal agency who regulates the rules, regulations, and the procedures to be followed by the parties of the sale for selling the aircraft, as well as the title of the form. Moreover, at the top-right portion of this section, the document’s record number can also be placed which is for identifying the assigned number of the form or document for easier searching and locating in the archives of the state agency after the sale is complete. Aircraft information – In order for an aircraft to be legally sold to a purchaser, it should be registered in the records of the state. The registration number that the aircraft has will then be disclosed in the aircraft information section of the form along with the manufacturer and the model of the aircraft. Additionally, the serial number of the aircraft should also be included in the form and other pieces of information which are relevant for identifying the aircraft subjected for a sale. 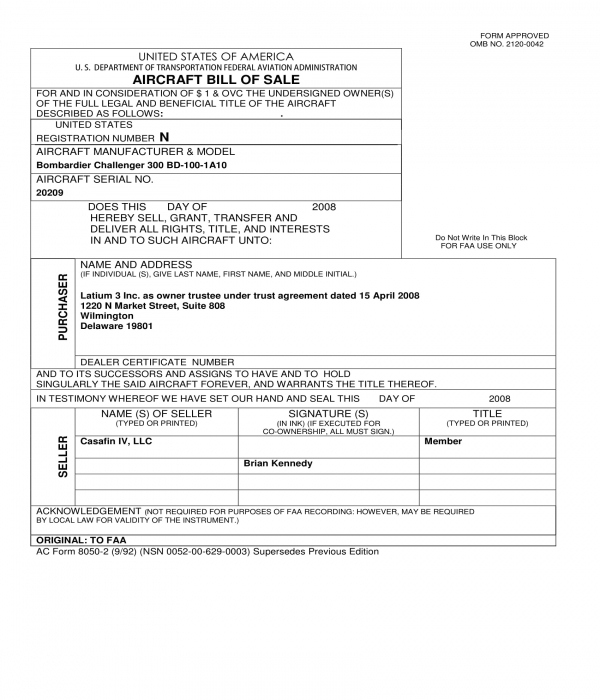 Sale transaction information – This section will specifically state the date when the sale takes place and the other procedures or actions which are included in the sale such as the transferring of the rights and titles to the new owner of the aircraft, and the name of the owner who will receive the title transfer. Purchaser or buyer information – The general information of the buyer will be stated in this portion of the form. It is important that the data of the buyer or the purchaser is up-to-date and that it is the same to the legal forms that he will be presenting for proving his identity. Some of the information to be disclosed in this section of the form includes the full legal name of the buyer or the purchaser, his residential address, and his dealer certification number if he is an aircraft dealer or a representative of a company who is purchasing the aircraft. Seller information – This section is where the seller of the aircraft will be able to state his personal information ranging from his name, his signature, and his title in the company that he is representing for. A company can also be represented by several individuals as their sellers depending on what the State or the country requires for the transaction. In addition, an acknowledgment statement can also be incorporated in the form as well. This, however, can be optional in some States depending on whether there is a need to acknowledge the transaction or the services executed by the parties of the sale. Aircraft Bill of Sale Information Form – An aircraft bill of sale information form is not only a document to be filled out and signed by the buyer, the seller, and the document-preparer of the state, rather it is a type of form which allows the involved parties to be able to have more information about the sale to be made and the form to be completed. In an aircraft bill of sale information form, there is a section which states how the form must be prepared such as making duplicates of the form and the necessity of having every piece of data and information in the form to be typewritten or printed. Another section which is a significant part of this form is the mailing instructions and the recording and registration fees section. This is where the seller and the buyer will be able to know the amount that they will be paying to have the sale recorded, and how they can send or mail the completed bill of sale form to the state’s registrar. Lastly, an aircraft bill of sale information form also contains a section which enlists the privacy acts to be observed in the transaction of the sale. This is for informing the involved parties that their disclosed data will be used for specific procedures in lieu of the sale and each data will be kept confidential and private within the registrar only unless they will request and permit a third party to use their information. Aircraft Warranty Bill of Sale Form – This aircraft bill of sale form variety has the same format to an agreement and a contract form. It contains the title of the form at the topmost portion without any other items compared to a basic bill of sale which indicates the state’s details. Then, the parties involved in the sale will be identified in a statement that indicates their roles. For instance, the seller undersigns that he is the owner of the certain aircraft which is registered with the serial number and model defined in the form. The identity of the buyer is also stated in a statement which indicates that he is the receiver of the grants and the transfers of the seller. Then, a statement of a warranty deed given by the seller will be included along with the date for when the sale is executed and a signature block to collect the signatures of the buyer and the seller of the aircraft. Does an aircraft bill of sale be proof of ownership for the new owner of the aircraft? No, an aircraft bill of sale will only be a proof of the transaction that occurred between the buyer and the seller. In order for the buyer to prove that he is the new owner of the aircraft, he should be able to present a title transfer form. 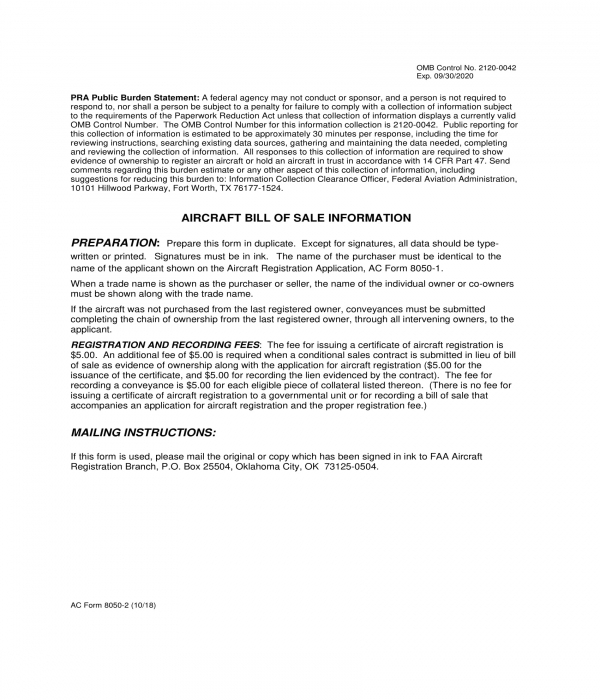 This document should be filled out and be signed by the buyer and the seller of the aircraft. Moreover, the transfer should be recorded to the State agency who regulates property transfers to ensure that the transfer is made legally and that the identity of the aircraft owner will be changed along with other relevant information to be updated after the sale is conducted. Is an aircraft bill of sale legally binding? Yes, an aircraft bill of sale is legally binding and it must be in writing and be notarized for it to be formally acknowledged in the court. To conclude, aircraft bill of sale forms are important to be made, be finalized, and be signed by the parties involved in the sale transaction of an aircraft. It does not only document the sale of the seller, but it also documents the identities of both parties which are significant for determining their obligations, roles, and their responsibilities in the item specified in the bill of sale. On the other hand, an aircraft bill of sale form should not be the only document to be made for this type of sale since it should be accompanied by other legal forms and it depends on the State of what other types of paperwork will have to completed and submitted by either the seller and the buyer of an aircraft. What are the Differences Between a Sales Contract and a Bill of Sale?